Toronto Mennonite Festival is held at Black Creek Pioneer Village, located in Toronto’s north-west at 1000 Murray Ross Parkway, next to York University (south of Steeles Avenue, east of Jane Street). Adult (15-59): $15.00. Child (5-14): $11.00. (Age 4 and under are free). Seniors (60+): $12.00. Students (15+ with ID): $14.00. Admission includes access to everything else that’s open on the site that day. Take Steeles Avenue exit. Turn left at lights onto Steeles Avenue. Follow Steeles past Jane Street. Turn right onto Murray Ross Parkway at first light past Jane Street. Look for Black Creek Pioneer Village entrance on the right. Exit at Hwy 7. Go east. Turn right (south) onto Jane Street. Turn left (east) onto Steeles Avenue. Turn right onto Murray Ross Parkway at first light. Look for Black Creek Pioneer Village entrance on the right. Exit at Hwy 400 North. Follow instructions above for Hwy 400 (northbound from 401). Exit at Jane Street. Follow Jane Street southbound. Turn left (eastbound) onto Steeles Avenue. At first light past Jane Street turn right (south) onto Murray Ross Parkway. 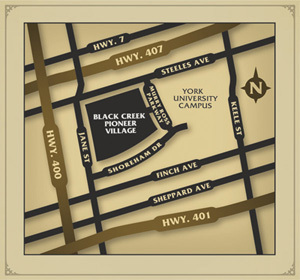 Look for Black Creek Pioneer Village entrance on the right. Parking is available at the Village at $7.00. The TTC’s Pioneer Village station is just a bit north-east of the entrance to Black Creek Pioneer Village in Toronto. From Toronto on the TTC, by bus: Go to Finch subway station. TakeSteeles bus #60 West. Or from Jane station, take bus # 35. More details about the TTC: www.ttc.ca.